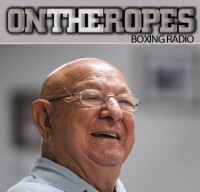 “On The Ropes” Boxing Radio returns this week with host Jenna J to discuss all the hottest fights and fight news in boxing. 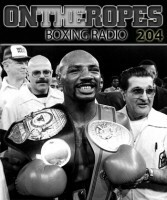 In this episode I will talk about the upcoming grudge match between ‘Sugar’ Shane Mosley and Ricardo Mayorga. The feud between Mayorga and Mosley didn’t end after their encounter in 2008, and now look to have a rematch to settle the scores. I will be speaking about the promotion in the lead up to this event which will take place this Saturday night, live on Pay-Per-View. 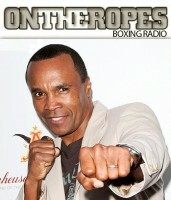 The first guest on this show is former NABF super featherweight champ, Jason Litzau. Following a three year break from the sport, Litzau recently made his comeback to the ring as battled to a split draw with Hylon Williams Jr. Jason talks about the result of the fight and what it was like to be away from the sport for an extended period of time. Lastly, Jason Litzau talks about his future as a boxer and what he hopes to accomplish at thirty two years of age. Also joining the show this week is the current WBC heavyweight champion of the world, Deontay ‘The Bronze Bomber’ Wilder to talk about the recent announcement of his next title defense against Johann Duhaupas. Wilder talks about the criticism he received for choosing to face Duhaupas. 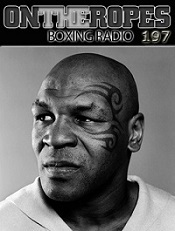 ‘The Bronze Bomber’ also shares his thoughts on Wladimir Klitschko’s upcoming title defense against Tyson Fury. In addition to this, Deontay Wilder shares his views on a possible fight between Floyd Mayweather and Gennady Golovkin. The main guest on this week’s program is none other than renowned trainer, Floyd Joy Mayweather Sr. Floyd talks about Mayweather vs. Berto and what he thinks of Berto as a fighter. Mayweather also shares his views on the aftermath of Mayweather-Pacquiao and discussed Pacquiao’s shoulder injury. Floyd also speaks a possible Pacquiao-Khan match up and gives his official prediction for his son’s September 12th bout. 8 Responses to "Floyd Mayweather Sr on Berto bout and Pacquiao’s injury excuses. 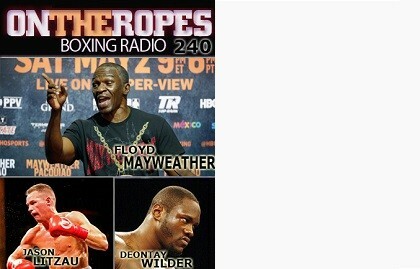 Deontay Wilder & Jason Litazu discuss their futures – OTR #240"
Real talk tho… How is it an excuse though when Pacquaio thought he won? Im sure Pacquaio knew how many times he connected and How many times Mayweather didnt? That is why there’s 100’s of video debunking FRAUD Mayweathers win. These videos are round by round and in slow motion documented. IT WOULD BE AN EXC– USE IF PACQUAIO STATED THAT HE LOST DUE TO AN INJURY TO HIS SHOULDER, but Pacquaio admit he hurt his shoulder during the fight and thought that he beat Mayweather! Pacquiao lost pure & simple. All sportswriters, analysts, commentators, current & retired fighters who were there that were interviewed after the fight all said Fraud ScumWeather Jr. won the fight. YOU’RE CONTRADICTING YOURSELF = Pacquiao did use the shoulder injury as an excuse. Roach & Pacquiao did NOT have the mental capacity to negate JailWeather’s tactics. 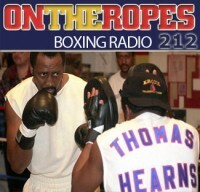 Plus, before the fight, CockRoach said he had no problem with Floyd’s bed buddy Kenny BrainLess as ref. WHAT ???? Thus, Team Pacquiao clearly & very easily got outsmarted. No more pillow fight !!! If all present rules are followed to have Obama added to the Arizona ballot, what reason, legal or otherwise, would one have to eliminate his name from their ballot?He has already met the renutremeqis to run for president, so what would be the grounds? Just curious…. 15 settembre: un aumento individuale Ã¨ un qualcosa legato ad una sola persona, per un aumento di responsabilitÃ o altro. i vostri sono aumenti legati alle mansioni e non sono individuali.